Post update: Since I published the original post several years ago, there have been some important changes. First, we managed to read aloud three of the seven Narnia Chronicles! Second, we took a short hiatus from the book in order to switch to other literature. Now my twins are asking me from time to time when are we going to continue Narnia - so the moment is coming when we will continue reading Prince Caspian. I can't wait! Third, our favorite version of The Complete Chronicles of Narnia in one book is no longer available from booksellers as new. Which means that you can only find it used. However there is some good news, too! I searched high and low to find what would be the best replacement, especially as I was in the market to buy a set of Narnia books that would be more manageable for small hands. 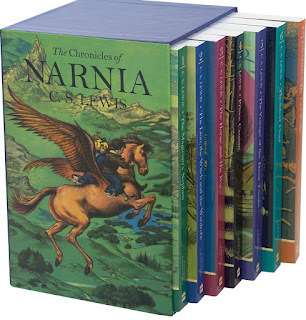 When the time comes for my kids to read the Narnia chronicles, I am sure they would prefer to read a set of seven books that one heavy edition. Why do I love this new seven-book edition, you ask? Because it has the same gorgeous color illustrations that we have in our book. Even better, the box set is perfect for reading aloud ... and for future reading by children on their own. The book size is manageable for small hands and the color illustrations by Pauline Baynes are simply out of this world. Now that I told you my new favorite, go on and read my old post below. This deluxe hardcover edition of The Complete Chronicles of Narnia is exactly what a "read aloud family" needs. A splendid version of The Complete Chronicles of Narnia that will easily help you to keep your young audience spellbound - year in, year out - with great help from the mesmerizing color illustrations contributed by Pauline Baynes. And yes, before you ask, it includes all seven chronicles: The Magician's Nephew, The Lion, the Witch, and the Wardrobe, The Horse and His Boy, Prince Caspian, The Voyage of the Dawn Treader, The Silver Chair and The Last Battle. Just look at the image of The Complete Chronicles of Narnia at in this post (now second image from the top!). But I ask myself - why did I order this superb version of C.S. Lewis' masterpiece now? Panic attack, pure and simple. I must admit my composed demeanor is a facade. Not very masculine, but these days everything goes. The internal panic attacks occur when I start thinking about what awaits my kids in their future lives and schooling. The uncertainty. The rat race. I guess that's what fatherhood is all about these days. By that measure - I guess I am a great father. And my worries crop up in the strangest of forms. 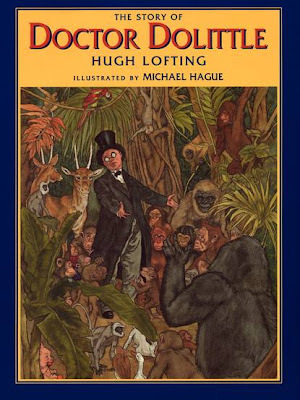 For example, every now and then I remember a classic children's book and I start worrying my kids will miss out on it. Or I fret they will dislike it after the first couple of pages, especially after coming across the crummiest edition of the book. Utterly pathetic, I admit, as my kids are still three years old. Nevertheless, this is the principal reason why I did not spare effort to search for the best available read aloud version of the Complete Chronicles of Narnia. Admittedly, I was also selfishly floating on the distant divine memories of the first time that I read The Lion, the Witch, and the Wardrobe three decades ago. Now, I can't wait until we do it together: dad + kids! Oh yes... I almost forgot to ask you. 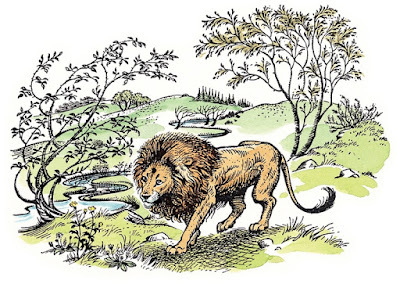 What do you think, at what age should one begin reading aloud The Chronicles of Narnia to one's kids? Did you say as early as possible? Wow! I love these coincidences! After I read your comment I simply had to take out my own copy of The Chronicles of Narnia ... to see it ... and just to imagine the day I will be reading it aloud to my twins. You husband has great taste, you tell him that! I'm really glad you are having a great time reading this edition aloud to your kids. BTW, what do you think - what is a good starting age for reading aloud The Chronicles of Narnia? My daughter is reading the Chronicles to her 5, 4, and 2 year olds. Even the 2 year old sits still and listens! Happy to have found your neat site! Imm reading "The Lion, the Witch and the Wardrobe" to my almost 5 year old and my almost 4 year old! My almost 4 year old listens well, runs around and plays, and then returns, while my almost 5 year old listens intently, she can recall the exact part of the story where we left off, etc. Even if they cannot appreciate the full depth of this work, the imagination is still engaged, and we'll certainly enjoy returning to the stories again when they're a bit older. Not to mention their exposure to the wonderful english! So glad to hear people are reading this to young kids!! I was putting it off (with difficulty) until they are older. I have a 5 yr old and a 3 yr old and thought I would wait at least a couple of years. But now, I am chomping at the bit to get started. Afterall you can read these over and over again. That is, after I make it through a dozen of the other amazing suggestions in this blog! I wonder how long the kids will let me read-aloud to them? That's a good question! I think one needs to be flexible as kids grow older and then allow them to read aloud to us as well and mix it up also with audio books. Kids rarely enjoy a one-way street for a long time. In fact, it should evolve more into a form of joint listening/reading time, which includes a lot of our reading to them. We recently started reading to each other the You Read to Me, I'll Read to You books, which are great as they have - on each page - a part for the parent to read and a part for the child to read to the parent. By putting them on an equal footing, they will enjoy being read aloud to for a longer period, at least that is what I hope! Better a late response - than never! Your two kids must be enjoying read aloud hour very much - and I am sure that they will enjoy the books even more when they hear them for the second time. That is my experience. My twins do not enjoy audio books too much, but they love hearing a familiar story - so that is when audio books come into play in our family. For example, I read to them the entire The Enchanted Wood collection (http://amzn.to/146nv0ya) long time ago, but they wanted to hear it again. So I took with me audio discs (we don't have an mp3 player in the car) and listened to all 15 audio CDs of Kate Winslet (http://amzn.to/1DgGUYM) reading Enid Blyton's Enchanted Wood stories - on our way to the seaside and back during summer holidays. They adored it. In fact - top tip - I was flabbergasted how audio CDs of children's books calmed them down in the car. INCREDIBLE. It is best to start with a familiar story (if your kids are not used to listening to audio recordings), as the familiar story will hook them. Also pre-listen to the narrator - as kids can be picky about whose voice and pronunciation they enjoy (hate).